I'm missing a few minis on my tally this season. Specifically, "Garrrgle Blaster Collector", "Karrrmic Battle", "Moarrr Booze! ", "Pirate Warrrs! ", and "Searrrching for Booty". I tried updating from 1.4 to 1.8, but they are still missing. Skimming the code, I don't see any obvious reason for this. Are other people using this script successfully? Oh, right. I heard about this KoL "bug". The names above are from the info booth. In the PvP archives they are called, "Gargle Blaster Collector", "Karmic Battle", "Moar Booze! ", "Pirate Wars!". That should be easy enough to deal with. As simple as removing the extra r's in the right place. Arrr! However, you'll want to delete your season 15 cache after making this change if you want to see accurate results. I attach a version of vgpb.ash with appropriate changes. You'll need to delete your season 21 cache and rerun it to see better results. This script doesn't work for me anymore (with mafia version 17185 that fixes the cookie issue) - I start it from the script menu in the relay browser and nothing happens except that mafia starts using up a lot of cpu. I can continue on with other things in mafia, which works fine, but the cpu usage stays high until I exit. Hey guys, I can't seem to get season 28's Holiday Shopping to come up for me. I just installed it (relay_* from first post, vgpb.ash from some posts above by Veracity) and it runs without problems showing Holiday Shopping for me. Which vgpb.ash did you use? 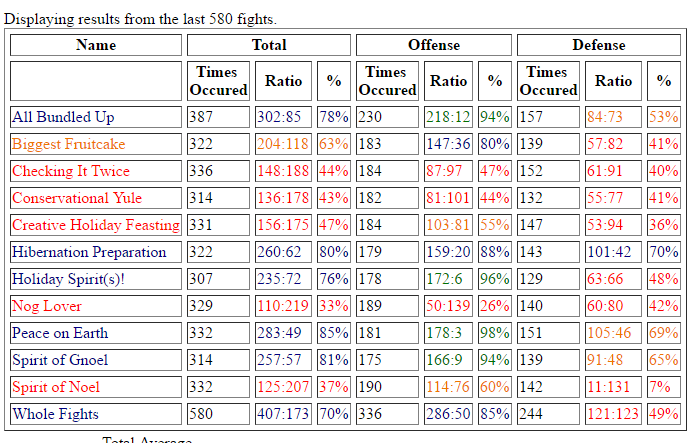 Displaying results from the last 1000 fights. Last edited by Croft; 11-09-2016 at 01:48 PM. I just ran into the same problem: after using the script for a week or 2, it just stopped showing Spirit of Gnoel for me. Last edited by the dictator; 11-15-2016 at 02:51 PM. Hmm, coming back to this, this season it's failing to show Thirrrsty forrr Booze for me.